Venturer. 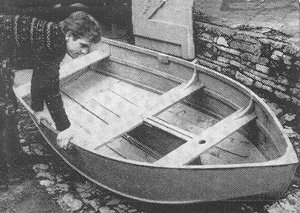 Double-chine plywood outboard boat designed as a seaworthy craft light enough to be trailed behind the smallest car (weight approximately 170 lbs.) Length 11 ft. 4 in., beam 4 ft. 6 in., total height 2 ft. 2 in., draft about 6 in. Venturer is popular as a fishing or camping boat. Six people can be carried by day and two can sleep on board protected by a canvas cover. Construction is simple and the appearance is attractive. For general purposes a 4 H.P. motor provides adequate power. The boat will plane at about 17 m.p.h. with a 15 H.P. motor and a crew of three. A 10 H.P. motor will lift it on to a plane. Except for racing, we do not advise a larger motor, but the boat will reach 25 m.p.h. with 18-20 H.P. Venturer de Luxe. This is a runabout version of the basic Venturer, with a longer foredeck and car-type seating instead of wooden thwarts. Both versions are included in the plan set. POWER 4 - 20 H.P. SPEED UP TO 25 M.P.H.